Monument of Jalesveva Jayamahe (Monjaya) is great evidence and very amaze suborder masterpiece. An endowment of high history value, as the reflection of the highness of Indonesian nation as the maritime nation one. The other meaning of this statue figure is as the readiness symbol to receive the devotion from generation to the next generation. This monument is a statue as high as 30,6 meters, which sustained by a building as high as 30 meters. 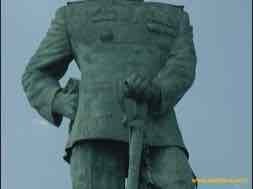 This statue depict a Commandant of Indonesian Maritime Army complete with his honor sword upstanding to stare towards the sea fully confidence and seriousness ready to dash against the wave and go through storm, which have shown, that is the aspiration of Indonesian nation. Monument that built by The Staff Leader of Indonesia Maritime Army initiative by then, Admiral TNI Muhamad Arifin and designed by Nyoman Nuarta can function also as Guide Lamp tower (Lighthouse) for ships sailing in its vicinity. There is giant gong Kyai Tentrem under the monument, which has 6 meters diameter and heavy more than 2 tons. Monument of Jalesveva Jayamahe taken away from TNI AL motto that means, "In the sea we are glorious" its height is 60 meters. The building consisted of concrete building domed four floors 30 meters that taken as copper statue fulcrums as high as 30 meters. At part of this building wall is made the history of maritime combatants warrior diorama (TNI AL) since revolution physical era until 90-an year. While its boom building functioned as TNI AL Museum and also as "Executive Meeting Room". 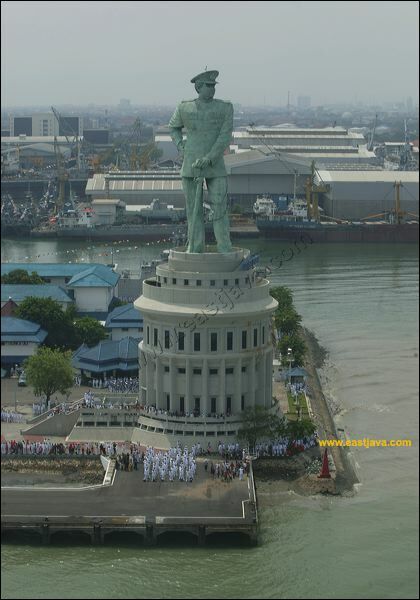 The statue depicts a Colonel of Indonesia Maritime Army with clothes on duty ceremony (PDU 1). His right hand is akimbo and his left hand holding a commando sword. The colonel eyes stare to the wide sea. At the base orbicular building floor, there is Kyai Tentrem gong. 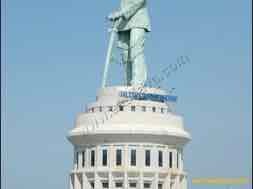 According to the Head of TNI AL Staff ‘Laksamana Madya Arief Kushariadi’, this statue heroic is intentionally given colonelcy. "Because the colonel is the heroic leader enter matured phase and ready to enter the terrace position,” he said. Why looking into the sea? "Because our future at the ocean," he repeated. The Side of Navy, said Arief, "we also hope that this monument will become the maritime tourism in Surabaya”. This monument is built since 1990 and opened in December 1996 that is jousting with the Republic of Indonesia Armada day on 5 Decembers 1996 by President Soeharto, with expense of Rp. 27 billion. The statue is mentioned as the second highest in world after Liberty Statue, 85 meters, is reside in New York port mouth. The numerical colonel become militant and has skin copper. It designer, Nyoman Nuarta, the famous statue maker from Bandung whp also create a copper statue of Garuda Wishnu Kencana in Jimbaran, Bali. Nyoman prints the statue body in his workshop in Bandung in module cuttings form. After it had complete, then it brought to Surabaya and matches each other. To make the statue, Nyoman Nuarta get 3000 copper tons from PLN, 60 tons from Telecommunication Departments, and a number of ex- bullet exuviate coppers. The reason of Monjaya built is because of an idea, which however it’s a nation advance must still tread at its history. Mean, "The Big nation is the nation which able to esteem the merit of it hero ". From many kind of hero and meritorious that have been doyen in blazing the way, uphold and fill independence of nation and NKRI, included in it of the warriors from the Indonesia Maritime Army. It is countless the sacrifice, which they have rendered. Even they gave their soul. Only partly small from they which we recognize and his name have been immortalized to become name of Republic of Indonesia Battleships. Besides as appreciation sign and souvenir from generation of router that still alive, it is also expected able to give a motivation to continue their struggle towards reaching of aspiration of Navy which great, powerful and Professional in place of NKRI which prosperous and fair. Without minimizing the historic events happened in Sibolga, Tegal, Pasuruan, Bali or it doesn't matter in this Indonesia fatherland history of Ujung as part of heroic town Surabaya region of course cannot be locked out of history of Indonesia Maritime Army, that is struggling march of Kaigun SE 21/24 Butai events on 3 Octobers 1945, what marked with the oath of the ‘Bahariawan Penataran Angkatan Laut’ (PAL) that is " I volunteer and candid to sacrifice good and chattel and also Body and soul for the State and the Nation". In the event of the next Indonesia Maritime Army history performance, Ujung has vital importance role, that is the basis (Base Home) the biggest Indonesia Maritime Army war ships hitherto, so that not too joke when some of publics named Surabaya town as seaman town or Navy town. In consequence it is competent when Monument of Jalesveva Jayamahe is built in Ujung Surabaya. Besides, it also expected the establishment of this monument can add the glorious of Ujung Surabaya that mean add to respect Surabaya as the heroic city and Indarmadi (Industry, Commerce, Maritime and Education).